Alongside the famous Aintree racecourse, home of the Grand National horse race, in the suburbs of Liverpool, the Aintree racing track was first used in 1954. It was three miles in length and very fast. At a time when there were few well-developed racing facilities Aintree had the advantage of sharing the grandstands with the racecourse. As a result it quickly rose to prominence in the austere post-war Britain. It was picked to host the British GP in 1955 and this turned out to be a memorable race as Stirling Moss took on and beat his Mercedes-Benz team mate Juan-Manuel Fangio, the pair running nose-to-tail for most of the race. Moss crossed the line just ahead to record the second closest finish in F1 history at the time. Two years later the British Grand Prix returned to Aintree. By then the British-built cars were beginning to make an impression and Moss and Tony Brooks shared victory for Vanwall, the first win for a British-built car in the World Championship. Moss won again in 1959 but the 1961 race went to Wolfgang von Trips' Ferrari. The Grand Prix returned in 1962 when Jim Clark won and British cars filled the top six places. 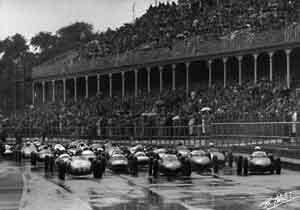 The racecourse was then sold to a new owner and doubts about the future meant that the British GP went instead to Silverstone and Brands Hatch. A shortened version of the old track is still used today, but only for club racing events.